This Limited Edition Military model recreates the original WW2 design supplied to the Czech Air Force in 1939. Robust engineering are combined with high luminous Arabic legibility and all powered by an ETA 2824-2 movement. 50m water resistant, stainless steel case with black calf leather strap & pin buckle. 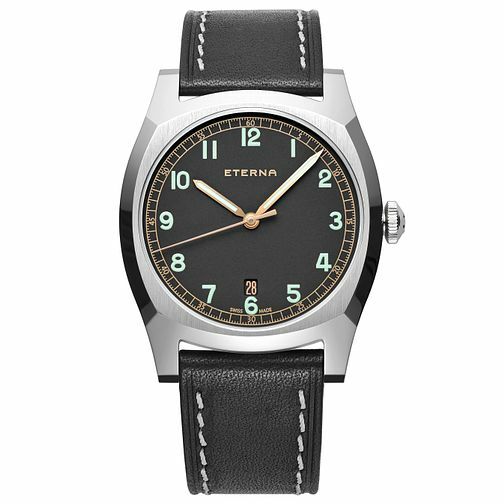 Eterna Men's Heritage Limited Stainless Steel Strap Watch is rated 5.0 out of 5 by 1. Rated 5 out of 5 by Anonymous from Stunning hommage to Eterna's tradition I own this watch, and love to wear it. It oozes quality, style and individuality. The face is exquisitely designed, the hands slender and readable, they're also gold plated! The sapphire glass is gently domed and even has an anti reflective coating on the inside which enhances readability of the matt face. The lines of the watch are beautifully integrated, with the profile of the case blending in seamlessly with the edge of the sapphire. It's a thing of beauty and a potential classic, which is why I bought one. For the record, Eterna watches easily match the quality of higher price watches like Omega but in my view offer more exclusivity.